Situated near a holiday home in Sandefjord in the fjords south of Oslo, Cabin Knapphullet by Lund Hagem Architects is so small and in such a location that it must have been designed as a hideaway. The cabin is set in an isolated spot which can only be reached by boat or via a path that heads south through the thick forest. 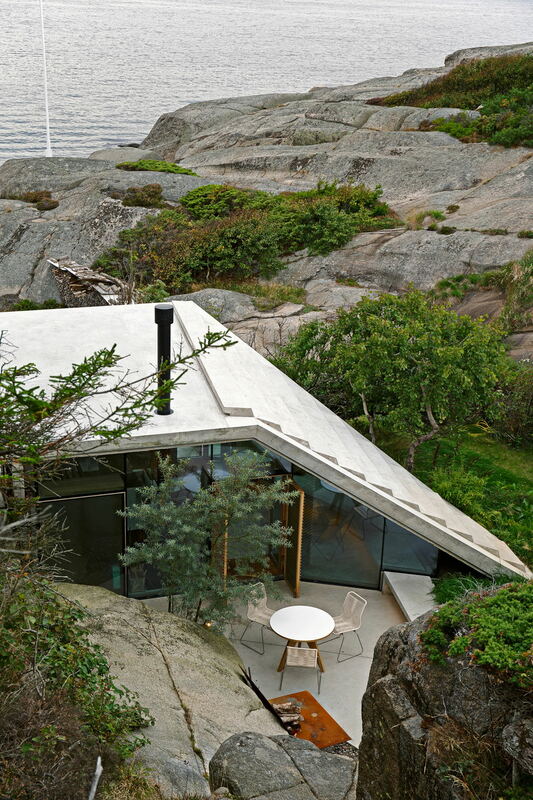 From the sea, Cabin Knapphullet stands out among the boulders and undergrowth typical of the Norwegian coastline. But despite its seemingly small dimensions, the cabin actually covers 4 floors. Architecture is a mirror which reflects and magnifies the customs of society, influenced by climate and locality. Freezing temperatures throughout most of the year mean that Norwegians have to make the very most of any sunny days. In summer, many of them stay in holiday homes along the coast, where everyone gathers to enjoy the outdoors and the natural surroundings. Tiny Cabin Knapphullet has been carved out between the rocks, its layout divided equally between indoor and outdoor spaces at ground level, creating a sense of continuity and emphasizing the concept of alfresco living. To get around the problem of the strong winds, the south side of the house is built against the rock face with a flat concrete roof; the roof slopes down northwards towards the ground, producing a wide, walkable flight of steps. The covered area below provides the living space for the entire house. Comprising around 30 square metres over three floors, it includes a living room with its own fireplace and a ground-floor bathroom. A staircase leads down to the basement storage area and up to the mezzanine floor, where there is only room for a double bed. The outdoor steps provide access to the rooftop terrace. This explains how such a small cabin can have an impressive four floors. 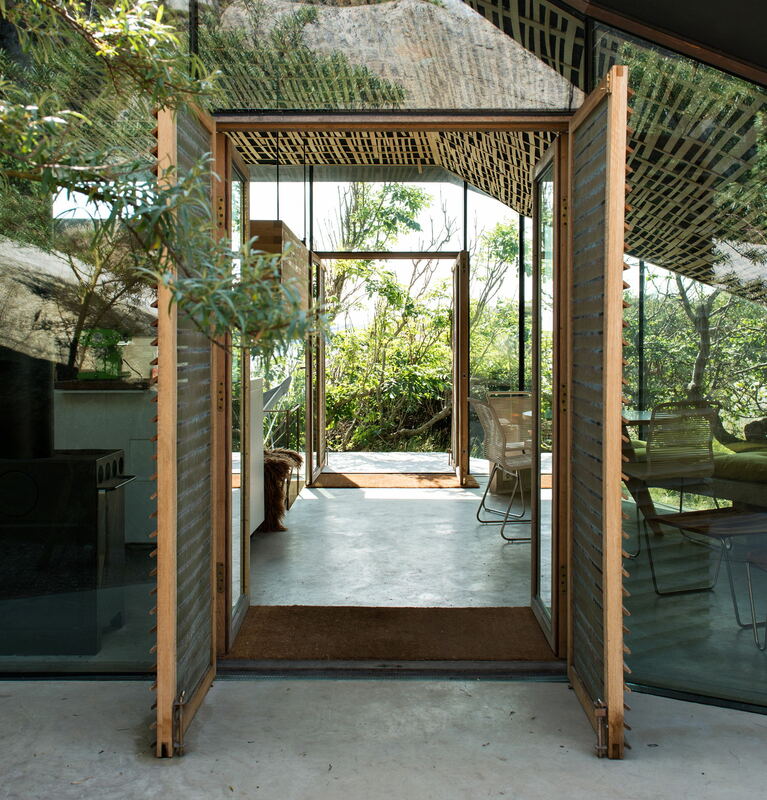 The impression of a single indoor and outdoor space stems from the east and west walls. 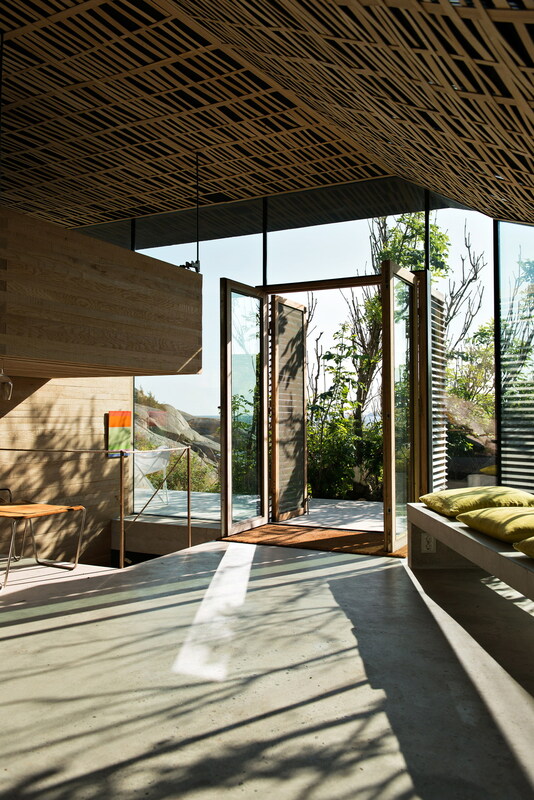 Made entirely of glass, they look onto two small courtyards: one faces the land and the other opens wide onto the sea. The east-facing atrium gets the morning sun, while the west-facing terrace catches the last rays of the sunset. A skylight has been positioned towards the rock face, brightening up the hallway and bathroom during the central part of the day. The lack of distinction between the spaces is emphasised by the fact that the concrete floor and bench extend outwards, where the roof slopes down, into the east-facing courtyard, marking the perimeter up to the rock face. The architects have explained that the layout was designed to give the outdoor spaces the best views, reflecting the local custom of spending as much time outside as possible during the summer months. The views from inside the house focus on the more intimate aspects of the surroundings: the surface patterns of the rocks and the changing vegetation over the seasons. The colour palette is inspired by the environment itself: the white concrete roof and bench imitate the rocks, the inside walls are made from durmast and the ceiling is covered in woven strips of oak.